Mayonnaise, glorious mayonnaise. For years I avoided mayonnaise and felt guilty any time I had it from listening to the fat-phobic conventional diet wisdom, but no more. 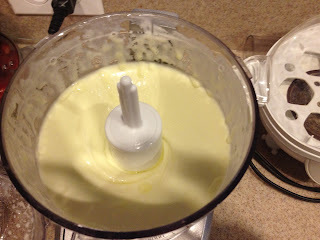 I was very skeptical at the idea of making my own mayonnaise as I've tried making other condiment recipes and none have lived up to what I think they should taste like. There are several paleo mayonnaise recipes out there, but I've had the best luck with Olive Oil Mayo from Melissa Joulwan's book Well Fed. She has an awesome blog and is an Austinite to boot. The ingredients are few but do not underestimate the importance of getting a very mild light olive oil. If you try to make this with extra virgin olive oil, you will be disappointed as it will turn out with a strong unmayonnaise-like flavor. I had bought two different brands to try. Out of these, the Star brand is the best I've found for mayo making so far. It has a very mild taste. I've made mayonnaise with a blender, a full size Cuisinart and my mini-Cuisinart. 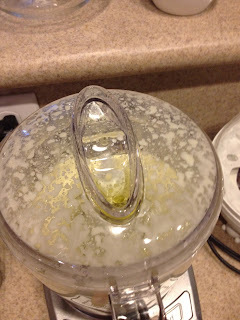 When I used a blender, while it actually made the mayo just fine, I found that it was more difficult to get the mayo out and I felt like more than I wanted was wasted in the work jar. Also, taking the blender apart to clean was an added pain. My full size Cuisinart also did the job just fine, but it also seemed like I was wasting precious mayo. 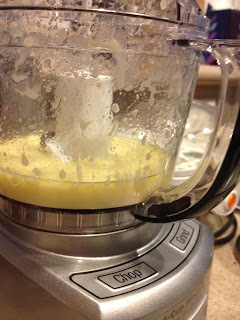 I like using my mini-Cuisinart best and that's what I used this time around. 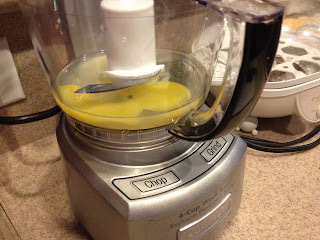 First, crack the egg into whichever mixing machine you are using and add the lemon juice. Wait until the egg reaches room temperature before continuing. This batch was made with Carbonell brand olive oil, not my preferred Star brand. Waiting on the egg and lemon juice to come to room temperature. 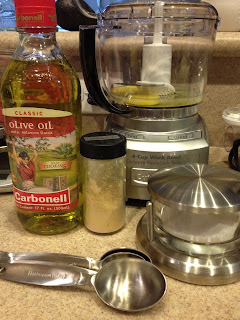 Add the dry ingredients and 1/4 of a cup of the oil and blend. Now its time for an arm workout. Your mission is to now add the remainder of the oil as slowly as you can possibly bear to do so. I may be weak, but my arm gets sore holding up my measuring cup during this process. My mini-Cuisinart helps a bit as it has a little reservoir on the lid with a small hole that helps me pace myself. I apologize for the lack of action shots, but I had one hand on the mixer button and one hand holding the measuring cup of oil. Your patience and arm soreness will be rewarded with creamy mayonnaise goodness. I store mine in a pretty glass jar. Prep Time: The book says 5 minutes and that's true with respect to your actual work time making the mayo, but you'll need to allow for time for the egg to come to room temperature. Clean up: Super easy clean up. All of the utensils and Cuisinart pieces can go in the dishwasher. The Paleo Review: Thumbs up! This recipe broke the homemade condiment curse on my kitchen. 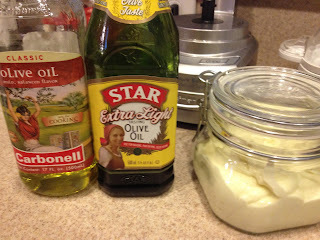 I love using this in my salads as a creamy dressing. Well Fed has some great suggestions for ways to use your mayo. If you make nothing else, make this mayo!